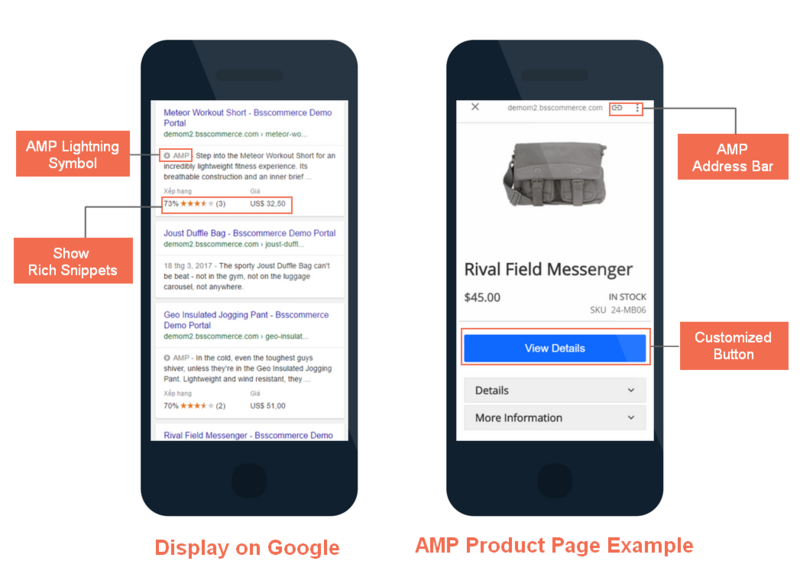 Following our previous blog A Guide to Google AMP for Magento introducing the basic knowledge about Accelerated Mobile Pages, in this article, we will go deeper into the pros and cons of AMP pages so that you can consider whether or not to implement on your store. Though the AMP project was just launched over a year ago with the collaboration of talented developers and well-known tech enterprises, the project has gained impressive archive. According to a report by Google at the end of 2016, AMP is now loaded at a 4 times faster speed than the traditional mobile pages. As an open source program, its potential is unlimited and promising. Ebay is the pioneer in implementing AMP pages for the Ecommerce site. Until now, they have launched 8 million AMP pages so far and proved the effectiveness and possibility of this newest technology for online trading. You can easily spot that the example home page supports image, video, banner and product list like the regular mobile page but at an incredibly fast loading speed. For product page, the design is somewhat similar with a description, social share and also can be displayed in Google with Rich Snippet. And the project is still on the progress of developing. Hence, there is still more potential coming and upgrade waiting to be done for even better Magento AMP pages. Mobile users do not have any tolerance for slow loading. They don’t have time for it and will click back right away. Hence, with its super fast loading speed, the AMP page is an effective solution to reduce bounce rate on your site. And as a result, lower bounce rate means higher conversion and sales. In a report by Google “A Year in Review”, they show that 90%+ of the AMP publishers drove greater engagement with higher CTR. Google has not yet announced that AMP is a factor affecting the ranking of a website on the search result. But we all know that a page with a fast loading speed and a low bounce rate from users will be favored for sure. Before planning to launch AMP pages for your Magento store, please remind that you still need a regular version of your mobile site. This version is completely different from the AMP version. And also, the AMP pages need a separate Google Analytics to track the performance of them. The AMP pages provide the information and details about products of your Magento in the fastest way. But for now, the shopping cart does not work in AMP. Which means, once the customers click on “Add to cart” in an AMP product page, they will be redirected to the regular mobile page. We list out some of the advantages and disadvantages of AMP pages with the hope for Magento store owners to have a more detailed look on this new technology and take a better consideration before launching your AMP pages. As the developing process is still on the way, we will keep you on track with the latest update of what AMP can do for your online business. Feel free to ask us any questions in the comment section!